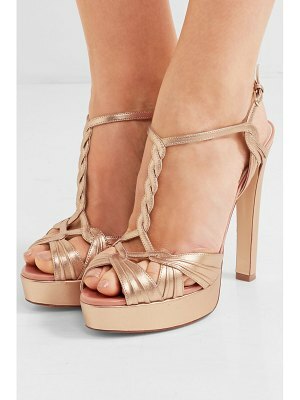 Metallic trim highlights suede peep-toe platform sandal. Self-covered heel, 5.5" heel (140mm).Self-covered platform, 1" (25mm).Compares to a 4.5" heel (115mm).Suede upper with metallic leather trim. Peep toe. Adjustable ankle strap. Leather lining. Signature red leather sole. Made in Italy.